This error message means pretty much “what it says on the tin”: That this stack isn’t installed and should be. And to correct this problem simply install that stack and you should be good to go. The only possibility that comes to mind is that different versions of RapidWeaver have stored their add-ons in different locations. It could be that you have more than one copy of RapidWeaver on your system and are occasionally accidentally launching a different version. Perhaps there is one version in the Dock and a different version launches when you double click a project file. Or something similar. The next time this happens, choose “Show Stacks Library in Finder”. 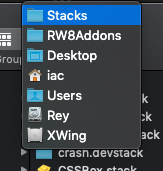 This will open up the current add-ons folder and show you all the currently installed stacks inside of it. This shows me that my add-ons folder is called “RW8Addons” and is inside my Desktop folder. Make a note of where your add-ons folder is for this launch. Do this same thing each time the “missing stacks” situation changes. Make a note of where your add-ons folder is each time. Report back what you find and also the name of the stack that is missing – and any other related info. I think with some more data like this we may be able to understand what is causing this deeper problem and help you correct it. Thank you very much for this. Indeed, this seems to have been the problem.